Sue Aikens From National Geographic Channel's "Life Below Zero"
The National Geographic Channel’s documentary series, Life Below Zero, follows 7 people as they struggle to survive the treacherous and remote lives they’ve made for themselves near or above the arctic circle in the Alaskan bush. Some of them are lone wolves; others have their families beside them. They fish, forage, and freeze in a wild-world that doesn’t care if they get through the winter or not. The premiere of Season 2 of Life Below Zero will air this Thursday, April 17th at 9pm. 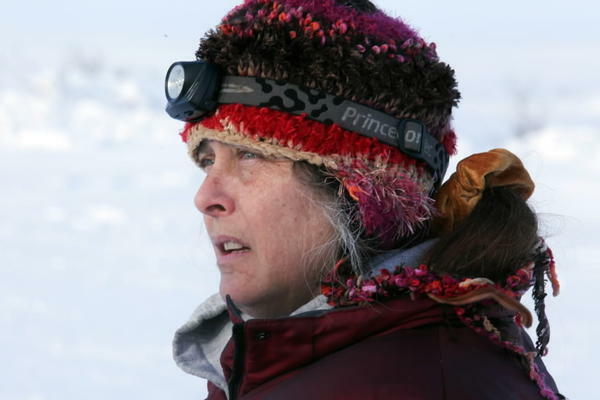 Sue Aikens lives by herself at Kavik River Camp, a place so remote the address is given in latitude and longitude, located a few miles from the Arctic National Wildlife Refuge. The ground is frozen year round so there is no way to dig a well yet - Sue has internet and telephone service - even if it does often drop in extreme weather. WAMC's Alan Chartock in conversation with National Geographic Photographer John Stanmeyer. Guest John Stanmeyer refers to a certain type of Indonesian bench that he bought for $125 in Asia, saying those same benches would probably sell at Asia Barong in Great Barrington, Massachusetts for $2000 or $3000. Asia Barong confirms that the items, in fact, sell in the range of $295 to $365. Tonight the National Geographic Channel will premiere their 6-part miniseries The 80s: The Decade that Made Us. The series is based, in part, on the book Back to Our Future: How the 1980s Explain the World We Live in Now--Our Culture, Our Politics, Our Everything by David Sirota. WAMC's Sarah LaDuke spoke with Sirota in advance of tonight's premiere. Michael Ian Black is a comedian by trade, having starred in the sketch comedy series “The State,” “Stella,” “Michael & Michael Have Issues” and more. But he is also a man of science. He is set to co-host “Duck Quacks Don’t Echo,” a National Geographic reality series that puts over-the-top theories to the test through in-studio and pre-produced experiments. Black will co-star alongside fellow comedians Tom Papa and Seth Herzog, who will conduct a variety of zany experiments in order to answer these questions: What happens if you give someone a nonalcoholic drink but tell them it contains alcohol — will they act drunk? Can four ceramic coffee mugs support the entire weight of a pick-up truck? Can pigeons can actually remember human faces? The show premieres tonight at 10PM on National Geographic. National Geographic's "The Science of Everything"
From refrigerators to roller-coasters, from neon signs to digital music - everywhere you turn the things around you help explain the fundamentals of science. National Geographic’s new book, The Science of Everything reveals the science behind virtually everything. David Pogue is the former New York Times tech columnist (he's now with Yahoo) has written the foreword to the book and we welcome him to the show. Flying Deer Nature Center is a wilderness school in New Lebanon, NY that has been connecting children and adults to nature and community since 1996. They offer school programs, programming for homeschooled children, adult programs in animal tracking, bird language, women’s retreats and more. Executive Director Michelle Apland and Programs Director Devin Franklin join us to tell us more.